Every bride and groom would like to make their wedding day a unique and magical experience, which is why many bridal couples are considering having their weddings in exotic, far-off destinations. Despite what many people think, a destination wedding doesn’t have to break the budget or cause much more stress than planning a wedding closer to home. Here are some great tips to keep in mind when planning your wedding from afar. When it comes to choosing the right location for your special day, it’s important to do a little research to find out if it really is the ideal destination for you. Have a look at online forecasts to gauge what type of weather to expect for the time you’re planning on having the wedding, since the last thing you need is a hurricane blowing in and ruining the big day! It’s also important to consider your guests who have to make travel arrangements and plan ahead when you have a destination wedding. Choose a venue that’s not too remote, and perhaps consider a destination where your guests could make a holiday out of the trip. The Grand Palm Hotel, Casino and Convention Resort in Gaborone, Botswana, features beautiful wedding venues and luxurious yet affordable accommodation options, designed to create memorable experiences. There is also a complimentary shuttle service from the airport, located stone’s throw from the resort, with access to Wi-Fi so bridal parties can keep in touch along the way. While stunning photographs of sunny beaches and lush landscape may be enough to sell you on a destination for your wedding, it’s important to pay a visit to the venue to make sure all facilities, accommodation and surrounds meet your expectations before booking. Check online reviews to get a feel for the venue and all that it offers to prevent any nasty surprises upon arrival. Visiting the location for your destination wedding before you start planning also gives you the opportunity to have a look around for local suppliers, such as décor specialists and caterers, instead of spending money to transport suppliers from home. This also adds a sense of local flair and culture to the day, making it an authentic and original experience for you and your guests. A list is every bride-to-be’s best friend! Making wedding to-do lists is a vital part of the planning process, and helps you organise all your ideas and priorities on paper to make sure your dream wedding goes off without a hitch. Instead of writing everything down on paper which could easily be misplaced, opt for a spreadsheet document either on your PC or, better yet, in the cloud, where you and your maid of honour or bridesmaids can easily update tasks on-the-go. This also gives you some peace of mind and allows you to monitor how everything is going and what still needs to be done. Start with your guest list, which you can share with your fiancé, and create separate lists for tasks like catering, décor, sound, music and lighting. It’s also important to create a “day of” list, detailing everything that needs to happen on the day of the wedding. As much as every bride would love to manage every aspect of her wedding right down to the centre pieces, sometimes it’s important to call in a professional to take some of the weight off your shoulders. Remember – this is your special day, and you still need to make time to enjoy it and spend time with your guests before it passes you by! Search for local wedding planners online who can help you with planning the wedding of your dreams, or simply liaise with management at the wedding venue of your choice to find out if they can offer any assistance. For bridal couples who do not have their own wedding planner, an in-house banqueting co-ordinator is available to help with weddings at The Grand Palm resort, ready to help make your day extra special. When planning a wedding in a far-off, exotic location like beautiful Botswana for example, try to tailor your wedding dress and the groom’s suit to fit in with the look and feel of your surroundings. For instance, you can add elements of the vibrant and colourful local cultural wear to your dress to make it stand out in photos, and even incorporate these patterns and materials into the décor of the wedding. It’s also important to consider the climate of your destination – for hotter, more humid conditions, opt for lightweight, breathable fabrics like cottons and lace. Planning a destination wedding can be challenging, however these tips will help make it a fun and memorable experience for any bridal couple. Remember to pay attention to the details and make use of resources at your disposal for a day that you and your guests will remember for years to come! Wedding packages start from as little as P285 per person and includes a buffet menu, venue hire, dance floor and more. 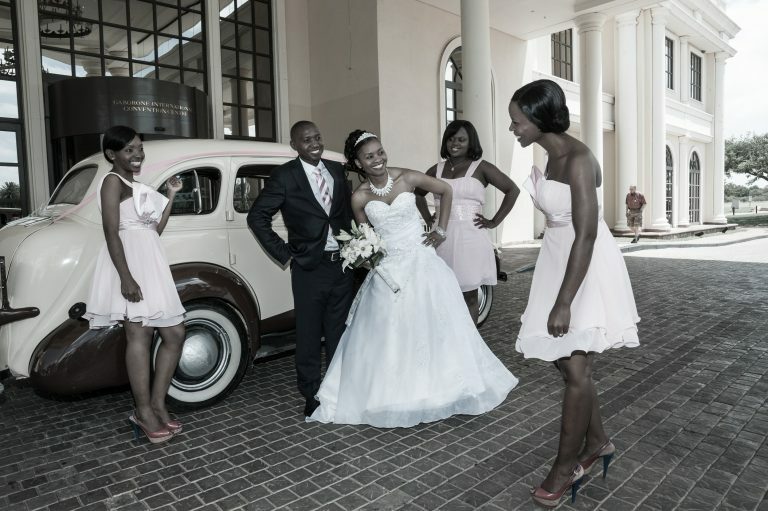 For more information on hosting weddings and spectacular events at The Grand Palm Hotel, visit www.grandpalm.bw or contact The Grand Palm Hotel Banqueting Department at +267 363 7803, email jmotladiile@grandpalm.bw. Previous Article Happiness is… homemade Iced Tea! The magazine for bold, brave brides! Shapewear for your special day!